Product prices and availability are accurate as of 2019-04-16 11:00:17 UTC and are subject to change. Any price and availability information displayed on http://www.amazon.com/ at the time of purchase will apply to the purchase of this product. 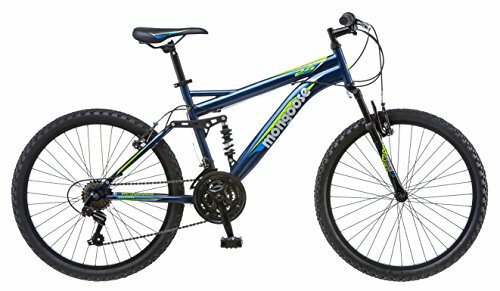 Navigate your favorite mountain path with the 24" boy's Mongoose griffin mountain bike. This trail-ready bicycle features 24" alloy wheels with strong alloy rims and mountain tread tires for a smooth ride, with a full-suspension steel frame that stands up to rugged terrain. 21-Speed twist Shifters allow for an easily customizable ride, and the padded seat offers added comfort while riding. Front and rear v-brakes complete the rad mountain bike experience. There's nothing you can't do on a Mongoose.